"SILVERTON, THIS IS GROUSE . . ."
that the most successful runs are those that have the best communications. on the air, or in immediate call-up, at each aid station for the whole time it is active." 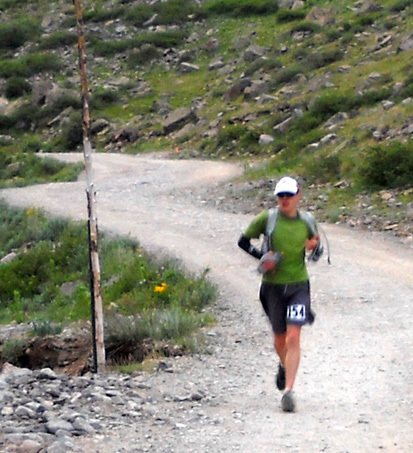 Runner accountability for safety's sake: that's the primary purpose of radio communications during a race in a remote area like the one in which Hardrock is run. It's easy to get off-course and "go missing" for several hours in this event, especially at night. One of the most difficult calls a race director (RD) has to make is whether to call out Search & Rescue to hunt for a missing runner. S&R services don't come cheap. As in some previous years at Hardrock, the radio folks, RD Dale Garland and his staff, and local Search & Rescue personnel were highly concerned about at least two runners for several hours on Friday. Jim and I were mesmerized by the action behind the scenes because we know one of the runners. More about that later. One of the advantages of being part of the communications team at an event like Hardrock or Leadville is to have the opportunity to hear the radio traffic while we are working our shift. 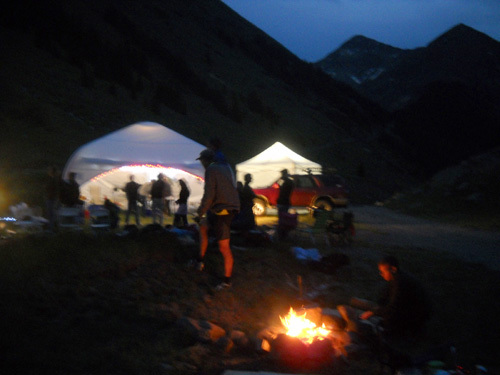 Not only were we able to hear part of what transpired during the "why race directors get gray hairs" missing-runners adventure on Friday night, we also heard information from nearby aid stations about runners' times in and out, who was in the lead, who dropped, etc. Information is transmitted by bib numbers, not names, so we had to frequently consult our alphabetical list to follow the progress of friends whose numbers we couldn't remember. 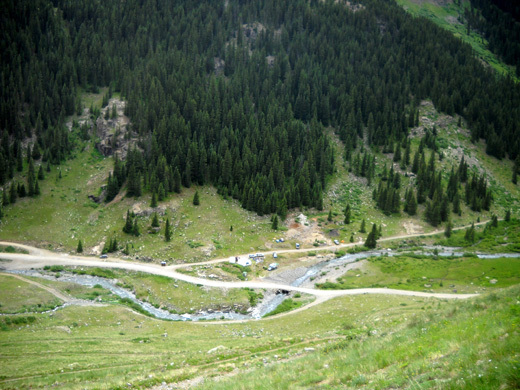 View north from Grouse Gulch aid station; runners come down the road on the right from Engineer Pass. If you thought times are tracked in and out of aid stations primarily for the benefit of crews or so runners will have accurate splits after the race or to make sure everyone runs the official course . . . you'd be wrong. While useful, those reasons are all secondary to the safety of the runners. In addition to runners who have "gone missing," reliable radio communications between remote aid stations (particularly ones with no phone signals) and headquarters are critical if there are serious injuries or illnesses like HAPE or HACE* that require a runner to be transported for medical care. Hardrock has communications down pat. The volunteers who place and maintain the repeaters on high peaks, the ones who carry their equipment to remote pack-in stations like Pole Creek and Kroger Canteen (Virginius Pass), the hams who have manned their aid stations for a decade or more, the folks who receive the information at headquarters -- these are some dedicated people, and most of them aren't even runners. and timing volunteers were in training and were deployed to other aid stations later in the race. If any of these groups of people are clueless about their responsibilities at Hardrock, they haven't done their homework. This has got to be about the most complete compilation of pre-race-specific information in ultra-dom! I like that. Other events would be wise to start transmitting as much useful written information to their participants via their websites. 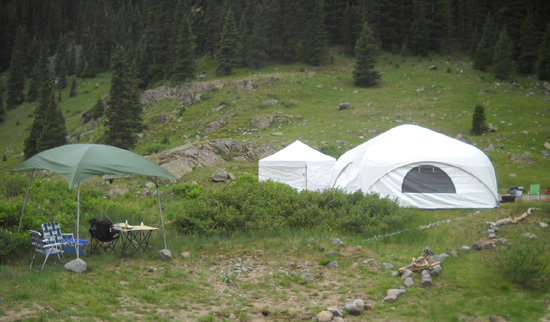 As mentioned in the last entry, we chose to work with ham radio communications at the Grouse Gulch Aid Station as our major volunteer job this year. We became interested in assisting more with the "comm" team after learning how they do their jobs at the race in 2009. It's a nice break from doing traditional aid station tasks, which we've done for 30+ years at road and trail races. 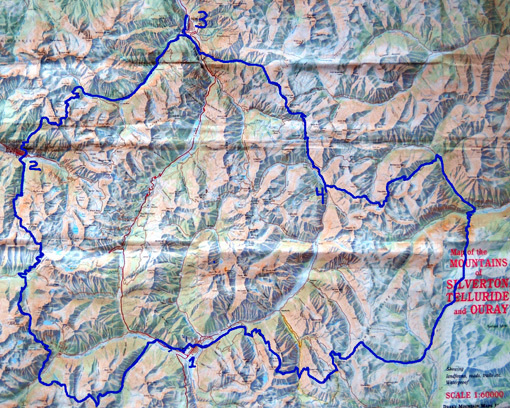 There are thirteen aid stations for runners when the race is run in the clockwise direction (Silverton to Telluride to Ouray to Silverton) as it is this year, fourteen in the CCW direction when Putnam Basin becomes a pack-in station near the end of the race when runners need more support. I simply took a photograph of part of the large Drake Mountain Map of the San Juan Mountains that is used by race management and the runners. I know you can't read any of the wording on this small map but you can see the course configuration (the blue loop) and the three towns through which the runners pass. 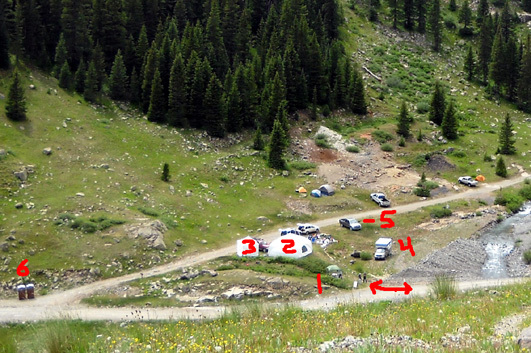 Number 1 = Silverton, #2 = Telluride, and #3 = Ouray. Number 4 is the location of the Grouse Gulch aid station, which is 58.4 miles into the course this year in the clockwise direction. 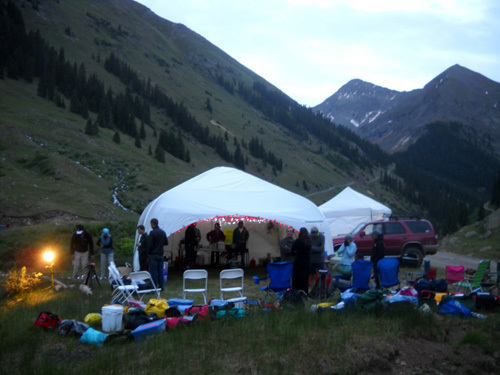 The largest and best-supplied aid stations are the three that are located in Silverton, Ouray, and Telluride; Silverton serves as the start/finish and race headquarters. 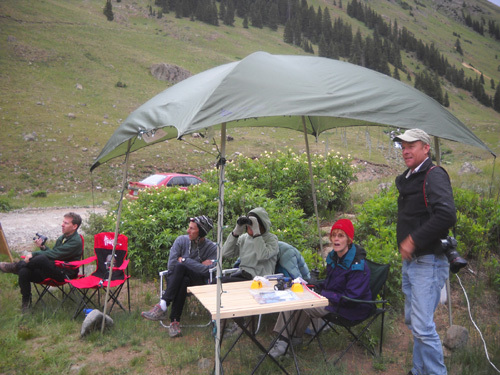 Seven of the aid stations are more remote, including ours at Grouse Gulch. Some of these seven can be accessed with 2WD vehicles, others only with 4WD. Four of the stations are so remote that they can be reached only on foot or with pack animals. Those have the fewest volunteers and supplies for the runners, but even those have ham radio volunteers to facilitate the safety of the runners. In previous years we've volunteered primarily as either co-captains (2006-2007) or helpers (2009) at the Cunningham AS. I also assisted at Grouse and Ouray when Jim was pacing a runner last year and Jim helped with communications at headquarters in Silverton. We've done several additional volunteer jobs before the race those years and in the early 2000s. This is our fifth year to volunteer at Hardrock. 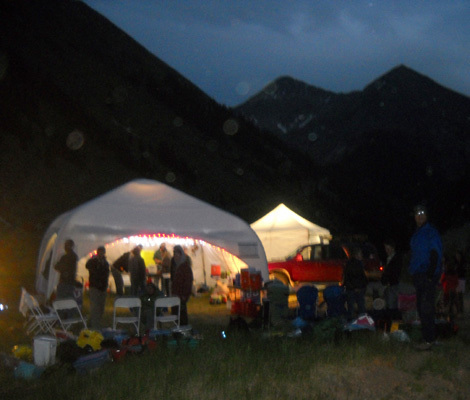 Since we've driven out to Grouse Gulch twice previously we already knew the aid station layout -- and how cold it gets so close to the north fork of the Animas River at night! That helped us prepare for our long vigil this year. 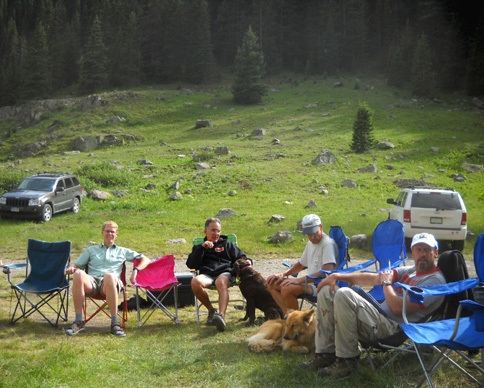 In 2007 we had lots of food and supplies left over at Cunningham Gulch on Friday morning (we were the first aid station that year in the CCW direction). The aid station coordinator directed us to take some of our leftovers to Grouse and return some to HQ. 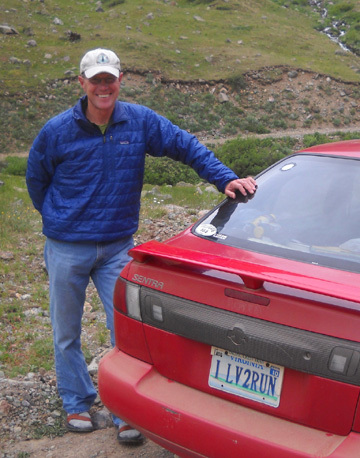 Then last year when Jim paced a runner from Grouse to Ouray in the CCW direction we spent a couple hours waiting for him at Grouse and got more familiar with the "lay of the land," although it was dark when we were there. We quickly discovered this year that the bulk of the runners also come through in the dark in the clockwise direction. That made it hard to see how friends were doing and was the main disadvantage of this particular aid station in a CW year. The race began at 6 AM Friday. Although we've watched the start a few times, this year we slept until about 8, knowing we'd be up all night working the radio. We did our own run and hike that morning, ran some errands in town, fixed lunch, and finished getting all our things ready for an anticipated 24-hour shift at the aid station. Including transit time and other preparation, it was at least 24 hours. 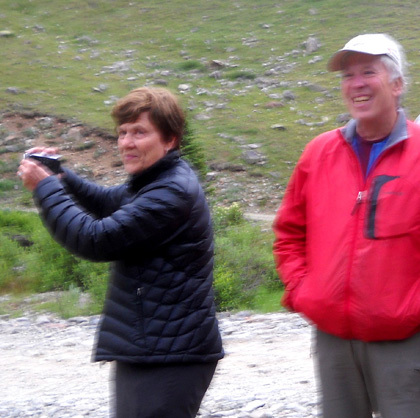 Around 1:30 PM we met Paul and Jigger, the couple in charge of ham radio operations at Grouse Gulch for the past dozen years or so, at the gym in Silverton. After catching up on the latest runner news from the communications folks at "Net Control" (ham-speak for headquarters), we followed Paul approximately seven miles out to our aid station. 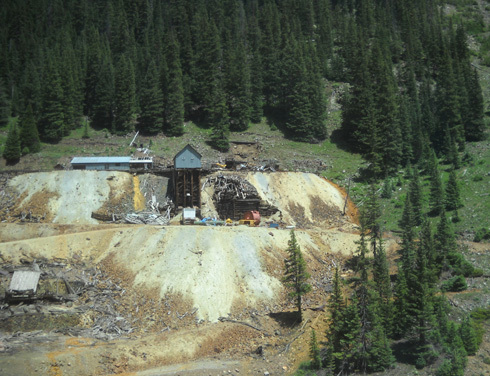 this is typical San Juan Mountain scenery. We're over 10,700 feet elevation here in this valley. 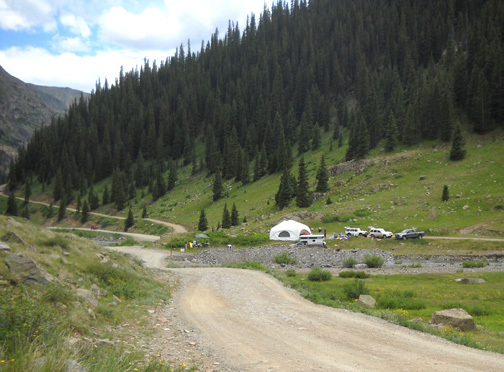 One of the reasons we chose this aid station is its relatively close proximity to Silverton. That doesn't mean it's easy to access, however. We no longer have a 4WD truck so the condition of the road was one of our criteria when choosing a location to work. The first couple miles out of town on CO 110 aren't bad for a dirt road; it's two lanes wide and fairly smooth. It gets a little rougher and more narrow on the next couple miles on the Engineer Pass Road (part of the Alpine Highway) from the intersection with the road to Cunningham Gulch at the former mining town of Howardsville. The Animas is more like a creek at this point but it gains volume quickly downstream after the south fork joins in at Eureka. 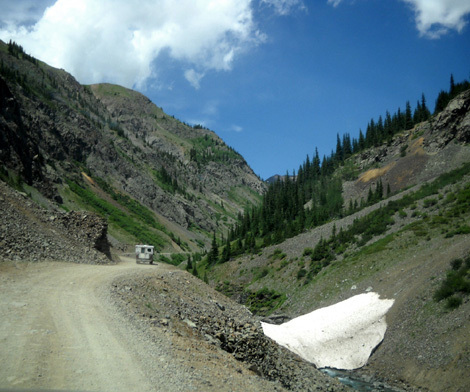 Like just about every road in the San Juan Mountains, this one is scenic even though it courses through the valley in this section and doesn't go over a higher pass like it does in a few miles at Engineer Pass or Cinnamon Pass. 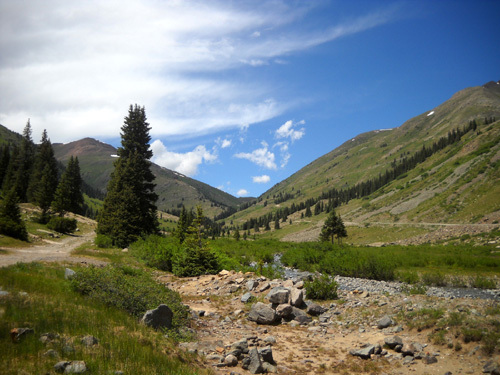 "Valleys" in the San Juan Range are pretty high up themselves; the elevation at Grouse Gulch is a lofty 10,710 feet. The road was originally used to access mines (see one above) before it became a tourist loop for Jeeps and other 4WD vehicles. 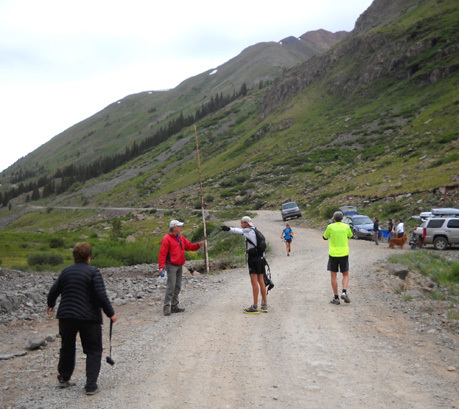 Runners, crews, and volunteers must share the road with these folks on race weekend, but most of the non-race participants are considerate when they see the runners on the road between Engineer Pass and Grouse Gulch. 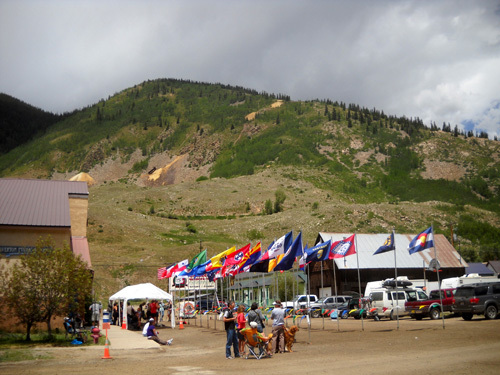 Many stop at the aid station to ask what's going on, and are most impressed when they learn that 140 runners are attempting to run a hundred miles at high altitude in these mountains! Almost there; what a pretty day! 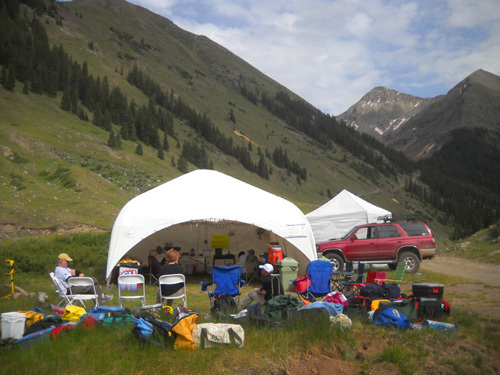 When we arrived at Grouse Gulch about 3 PM the aid station captain and his first round of volunteers were already set up and waiting for the runners. Some brought tents so they could work all night or in two separate shifts separated by a few hours of sleep. Paul knew just where he wanted to park his truck camper between the AS tent and the river. We parked our truck behind and above him on a bank facing the road where runners would enter and leave the aid station. I'll show several views of the aid station throughout this entry. up the mountain on switchbacks (top arrow) toward American Basin and Handies Peak. 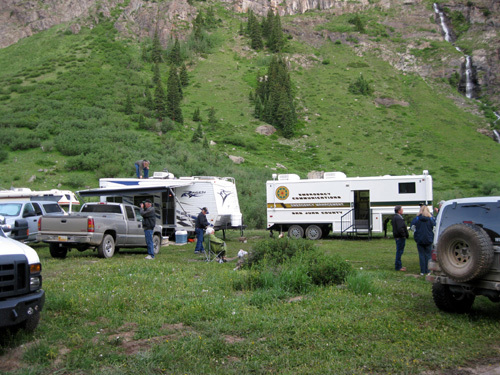 Our gray Ram 2500 truck is in the foreground; Paul's camper truck is below us to the left. It was a good spot with a view of the road, aid station, and surrounding mountains. Too bad it was dark so much of the time we were there! Paul's camper in the bed of his truck served as our small team's ham radio headquarters for all but a few hours during the night when he slept and Jim manned his own radio in our truck. Jim's a ham operator; I'm not, so I couldn't officially transmit information over the radios but I could help them listen for and record information and do other tasks I'll explain in a minute. I spent most of my time with Paul and/or Jim either in the camper or our truck. Two other couples worked in shifts to help Jigger record runners' times in and out of our aid station. They were set up near the road and along the path the runners used to get to and from the AS tent. Jigger was out there in the cold, under a canopy, the entire time the aid station was open, but she remained perky and efficient the entire time. She clearly loves that job. Jigger (red hat), volunteers, and crew members react as the first runner is spotted up the road. I enjoy doing timing, too, but under different circumstances and for a shorter shift. After enduring a long, sedentary, bone-chilling night doing timing at Bandera in January I vowed I'd never repeat the experience! As soon as Paul and Jim got their radios set up, and long before any runners reached our aid station, they began listening to the radio traffic between headquarters and the other aid stations on our frequency. Above and below: volunteers relax while waiting for the first runners to appear at Grouse. I took the opportunity to hike with Cody about a mile up the trail runners would be using to reach American Basin and Handies Peak after leaving Grouse. With all the switchbacks, the grade from 10,700+ feet at the aid station to 14,000+ feet on Handies isn't too severe but it's a haul. I got high enough that the aid station looked very tiny from my perspective along the trail. A couple of those photos are shown farther below. WILL ALL THE MEN GET "CHICKED" THIS YEAR? When I got back down to the aid station at 4 PM Jim and Paul were eagerly listening for information about the location of the front runners. 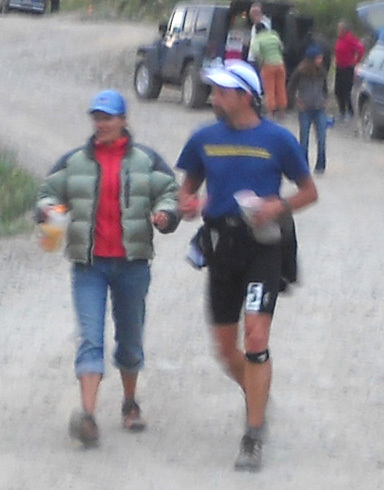 At 4:01 two runners entered and quickly left Ouray, two aid stations and 14.5 miles before ours. Even as fast as Diana Finkel and Nick Pedatella were moving, it would be several hours before they reached Grouse. A woman, indeed! In close second behind Jared Campbell from Chapman (18.9 miles) to Governor Basin (36 miles), Diana overtook the lead and Nick caught up to her by the Ouray aid station at 43.9 miles! We wondered if or how the lead would change by the time they reached us. Cool!! This made the race more exciting for everyone watching/listening. Maybe all the guys would get "chicked" this year! A female has never won Hardrock outright, even when Krissy Moehl obliterated the previous women's record in the other direction. Last year Diana came in third overall; Jared was sixth. This could get quite interesting! Hearing the times in and out of the other aid stations is definitely one of the best reasons to work the radios during a race. that's the Animas River flowing by the aid station. As soon as the first runner reached Engineer Pass, the aid station right before ours, we listened intently as the ham called in the times to HQ in Silverton. Jim and Paul began writing down the runners' times OUT (not in) so folks at our aid station could estimate their arrival. Although it was "only" a 6�-mile downhill run/walk to our station -- one of the shorter and easier sections on the course -- it was still 50+ miles into a grueling, high-altitude race and it took some of the slower runners over three hours to reach us. Guess who clocked into (and OUT of) Engineer Pass first at 6:24 PM -- Diana!! Nick arrived about two minutes later and stayed about four minutes. I think everyone at our aid station was saying either out loud or to themselves, "Go, Diana!" except for Nick's, Jared's, and Karl Meltzer's crews! 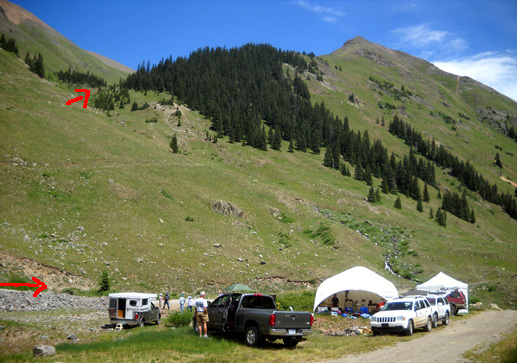 Grouse Gulch is a popular crewing point in the race because crews don't need a 4WD vehicle to reach it and they don't have to lug their runner's supplies very far from where they park. Although it's a long drive for them from their last crewing point in Ouray, they can get there a lot faster than their runner. It's also a point where some pacers pick up their runners. Consequently, there are lots of crew members and pacers hanging around this aid station for several hours, all anxiously awaiting their runners' arrival. I can surely empathize with them. As many times as I've crewed for Jim in races, I know how valuable it is to know when he's left the previous aid station so I can better estimate when to expect him. Paul and Jigger have a successful system at Grouse to keep crews and pacers informed about their runners and virtually eliminate individual runner inquiries that can take valuable ham radio time and air traffic: they set up a wooden "sandwich" (message) board near the timing canopy and write down the runners' times OUT of Engineer. Crews can simply find their runners' number to see when/if they left the last aid station and estimate the time it will take them to reach ours. They have little need to bother either the timers or radio operators. 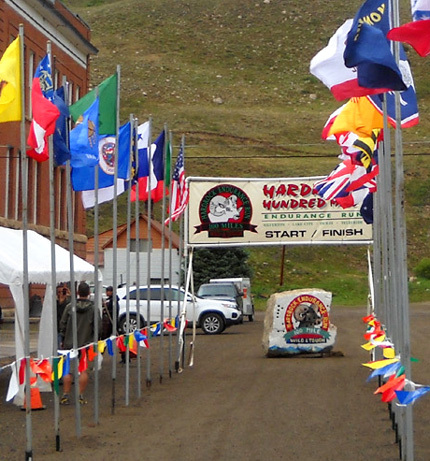 In fact, at Hardrock (unlike Leadville, where we've done a similar job) they are told not to ask the ham radio folks about their runner. Some folks did express concern about the time it was taking for their runners to reach Grouse from Engineer, but the nearby timers dealt with that and everyone who was expected did make it to our aid station before the absolute cut-off on Saturday morning. I don't know if posting OUT times from the previous aid station is standard operating practice at the other HRH aid stations or used in other races but it's a win-win for crews and communications people and I highly recommend it. Every time Jim or Paul heard the communications person at Engineer transmitting times IN and OUT over the radio to headquarters, they wrote down the numbers and OUT times on a sheet of paper. Times out were the only ones relevant to us. When we had a list of ten or fifteen numbers, I hopped out of the camper and walked them over to the board, where I wrote them down for the crews to see. 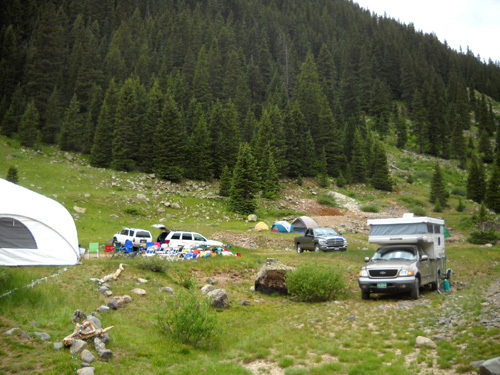 View farther to the right, showing runners' drop bags, our truck, and Paul's truck camper. A group of crew members would gather around me every time I appeared with new names. They appreciated the information and it gave me more of an opportunity to interact with them and the runners who happened to be arriving at or leaving the aid station. We couldn't see the runners from inside the camper very well, especially after dark -- and most of them arrived after dark. Crews at Hardrock also have the opportunity to check their runners' status online during the race if they have a laptop computer with them or at their place of lodging. 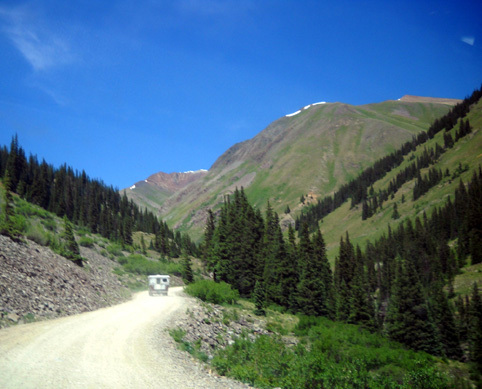 Most of the aid stations don't have internet connectivity but crews can access the internet in and near Silverton, Ouray, and Telluride. They can also check the computer screens at HQ when they're passing through Silverton to get from one part of the course to another. That's a popular gathering place during the race. I was about as excited as anyone else at the aid station, barring the front-runners' crews, as the time approached that we estimated the first runners would appear at Grouse. 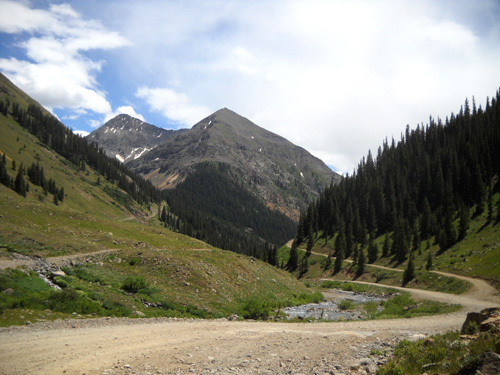 I stood out at the road near the timers as I peered up the dirt road toward Engineer Pass, hoping Diana would still be in the front. I was surprised when David Horton (above), one of my favorite ultra people, came over and gave me a hug; I wasn't expecting him there. We didn't have long to talk so I'm not sure if he was crewing, pacing, or just spectating the race. David used to have the course record in one direction. That's one of many ultra running achievements in his repertoire. Diana checked in with the timers but was out in a flash with the gear and supplies she'd need in the next 13.4 miles over Handies Peak and on to the Sherman AS. That's the longest distance between any of the aid stations at Hardrock and it's during the night for the many of runners, so they need to be well-prepared. 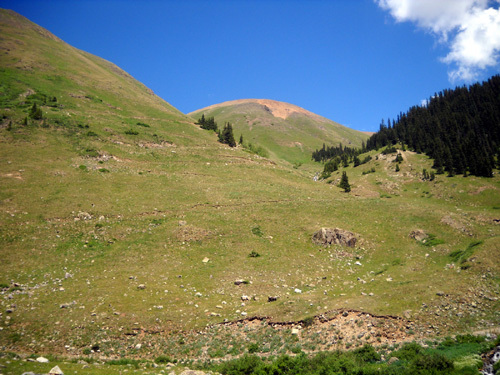 (lower arrow) head for the trail up to Handies Peak (upper arrow). Nick charges into Grouse Gulch. Jared talks with his crew person as they walk toward the aid station. Diana had a sizable lead on both of them but a lot can happen in a race like this. I returned to my duties after Jared came in and didn't get any more photos of runners coming into the aid station. Karl Meltzer, who has previously won the race five times and holds the course record in the other direction, came in fourth but decided to drop at Grouse. He's been injured several times this year, including a broken arm and bruised ribs. He came into this race with a still-healing broken clavicle. I think it's remarkable he did as well as he did for over 58 miles! The trickle of runners didn't peak at Grouse for several hours. Even the "bubble" was spread out from about midnight to 5 AM on Saturday. The average 48-hour time for runners to reach Grouse was 7:30 AM on Saturday; after that, it was unlikely they'd reach Silevrton by 6 AM on Sunday. The absolute cut-off at our AS was 10:30 AM on Saturday. SILVERTON, THIS IS GROUSE . . .
Once runners began coming into Grouse Gulch, Jigger and her timers meticulously kept track of them on the race's standardized timing sheets as they entered and left the aid station on the narrow path by the timing canopy. Jigger would either call a group of their numbers and times in and out to Jim and Paul or she'd send the list back with me for them to report to Silverton. I was a "runner" of sorts, carrying information to and fro. The job didn't take much brain power but it made me happy to be able to move around to socialize a bit and to keep warmer. Paul's supply of propane in the camper ran out shortly after dark so it was nearly as cold inside with Paul and Jim as it was outside under the timing canopy. The warmest places at Grouse on Friday night were the aid station tent and the roaring wood fire outside. Just ask the crews! When Jim and Paul had about ten runners' numbers and IN/OUT times at our aid station they called them into headquarters over the ham radio system. They had to compete for air time with the hams at other aid stations doing the same thing. At that point in the race, runners were spread out over many miles of the course. Net Control can talk to only one person at a time on each frequency. Some aid stations used computerized "packets" to report the times, which eliminates a lot of voice traffic over the air. Paul prefers to use traditional ham radio techniques at Grouse. That's not as efficient as packets but more fun for Paul and some of the other hams. If it wasn't satisfying, they wouldn't keep coming back to help. As runner numbers/times in and out of the aid stations were called in, communications volunteers at HQ posted the information on the race website. Folks with computer access anywhere in the world (or much closer, in the gym itself or at an aid station with connectivity along the race course) could follow the runners' progress in fairly close-to-live time. You can see the final splits at this link. It pretty much looked like that during the race, only it was being updated constantly. Paul and Jim called in the numbers of the nine runners who dropped at our aid station (no one was pulled) and relayed requests for more supplies from the aid station captain. They noted the runners who dropped at previous aid stations, too, so we'd know how many to expect at Grouse. I don't believe they had to call for additional medical assistance at our aid station; we had some stationary and roving medical folks there throughout the race that took care of any problems. 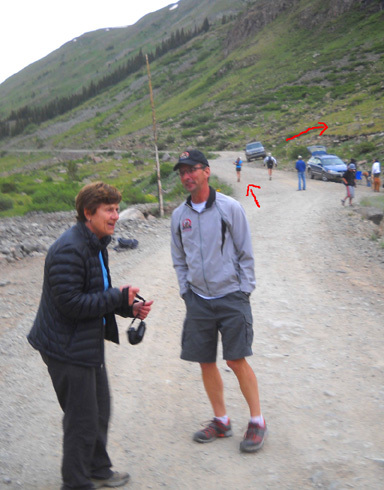 The main safety issue with which Jim and Paul assisted was during the night on Friday when two runners "went missing" somewhere between the Chapman (about mile 19) and Telluride (about mile 28) aid stations. Volunteers at Telluride became concerned when the two runners didn't show up after everyone else had long been gone. That initiated a lot of radio traffic. It was very interesting to see and hear some of what goes on behind the scenes when a runner is missing. RD Dale Garland was at our aid station watching the front runners come in when he first learned about the two missing runners. He was in and out of Paul's camper for several hours, making/receiving calls over the radio to the hams and aid station captains at Chapman and Telluride (who had to stay in position until both runners were located), to headquarters in Silverton, and eventually to Search & Rescue when it was over ten hours since one of the runners had last been accounted for. Fortunately, one of the runners finally ended up back at Chapman and the other one reached Telluride just before midnight. 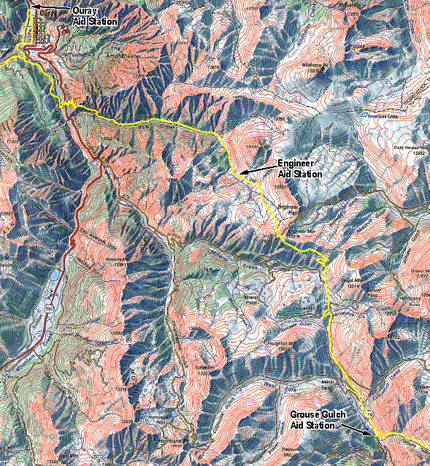 All the other runners had cleared Telluride by about 7 PM, so you can understand why folks were concerned. 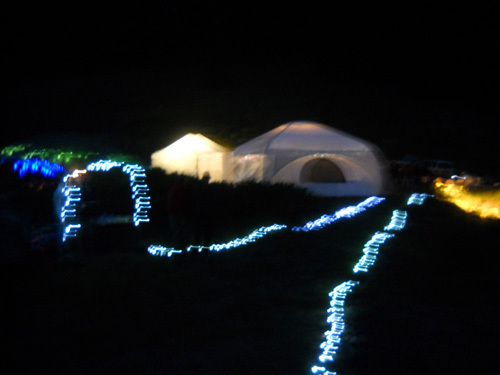 This blurry night shot of our aid station appeals to me more than the less-blurry ones. We were particularly interested because we know one of the runners who was involved, George Velasco. He's the one who didn't get to Telluride until almost midnight. He was later commended by race officials for trying to find and assist the other runner, who George heard (from a third runner) was injured, disoriented, and possibly off-course between Oscar's Pass and Telluride. George knows how dangerous these mountains can be after dark -- especially if you're injured and possibly disoriented and/or lost -- and he was conscientious enough to sacrifice his own race in an effort to help the other guy. He went backwards to try to find him. Because of the hours he lost trying (in vain) to help the other runner, George missed the cut-off at Telluride and had to drop out. You don't hear stories like that very often except in ultra-distance sports like trail running and adventure races, do you? I was impressed with how calmly (outwardly, at least) and thoroughly Dale handled the situation and relieved that both runners were eventually accounted for, safe and not badly injured. I don't believe a search was mounted, but it was imminent. This incident illustrates how important it is to have a good communications system operating during an ultra-distance event in the wilderness. If aid stations have cell phone access, it's easy to keep track of runners by phone. 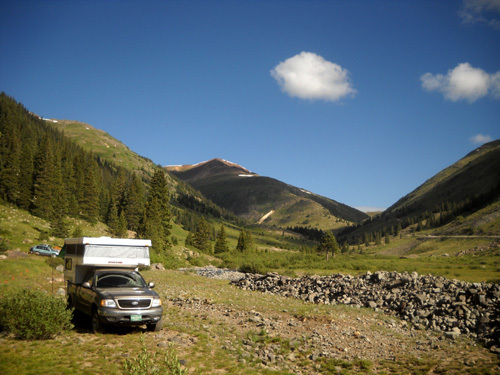 In a remote area like the San Juan Mountains, however, radios are required to maintain contact. Not all races have as many dedicated communications volunteers as Hardrock. Some races don't require their ham folks or aid station captains to remain in place until all the runners reach the next aid station, either. That makes the volunteers' shifts longer but it's another important safety feature for the runners. If no one had been at Chapman when the injured runner went back to it (he was apparently closer to it than Telluride), he would have been in a world of hurt in that remote area on a very cold night. Communications and aid station volunteers kept busy all night at Grouse since the bulk of the runners came through after midnight. It was hard to see what was going on from inside Paul's camper but we could tell from Jigger's IN/OUT reports that there was plenty of activity going on less than a hundred feet away. I helped Paul with radio communications in the camper from about 3:30 AM to 5:30 AM on Saturday morning when Jim joined Cody in our truck to try to get some shut-eye. It was interesting to get to hear about Paul's experiences as a ham radio operator and instructor, his adventures as a pilot, and his trips to Alaska (I've given up previous dreams of getting a pilot's license, but visiting Alaska is still high on my bucket list). I was too wired on caffeine and the excitement of the race to even attempt to sleep until Saturday afternoon when we returned to our own camper. Soon after Jim woke up and came back out to Paul's camper around 5:30 AM, our good friends Deb and Steve Pero arrived at Grouse. Steve was pacing Deb. 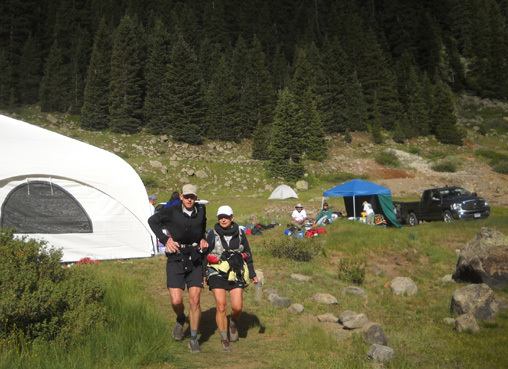 We were dismayed to see Deb bent over in her chair inside the warm aid station tent so we went over to talk quietly with Steve periodically to see how she was doing. She wasn't feeling so great at that point, although she'd had a good run through the first half of the race. Steve made sure she got some rest. Deb later determined she hadn't taken in enough electrolytes and was having problems with hyponatremia. Twenty-three minutes after that, the first runner arrived at the finish line in Silverton. That's what I'm talking about re: one of the advantages the communications volunteers have -- knowing right away, from even a remote location, who won the race. No, it wasn't Diana Finkel. Rats. Although she was still leading the competition by six minutes at the last aid station (Cunningham) at 91.3 miles, she began having stomach problems and cramping up. Jared Campbell passed her in the last few miles and gained a sizeable lead. He finished at 9:18 AM on Saturday, a cumulative time of 27:18 hours. Diana slowed down but still finished second overall (possibly the highest female finish place in race history) at 10:32 AM for a cumulative time of 28:32 hours. Third place Mike Foote was over an hour behind her; he was in fifth place at Grouse. Nick Pedatella, who was in second place at our aid station, fell back to fifth place at the end. That illustrates my earlier comment that a lot can happen over the course of a 100-mile race, especially in the second half. Meanwhile, after Jim woke up Paul took a nap in the back of his camper (where his radio was) from about 5:30 to 7:30 AM. I joined Jim in our truck to use Jim's radio during this period of time. Ahh . . . with the heater on, I was finally warm again! I could also see what was going on much better out our truck windows than from inside Paul's truck camper. This is more like it . . .
By 5:30 AM Saturday there were fewer runners coming into the aid station and they were farther and farther apart. Most of the runners had left Engineer by then, so my job of listing times on the board was almost done. I continued bringing back times in/out of our aid station to Jim so he could relay them to Silverton, and monitored radio traffic when Jim took breaks to walk around. The "second sunrise effect" is almost as strong for volunteers and crews who have been up all night as it is for the runners. There is usually a surge of energy and it's much easier to stay awake. After the sky began to lighten up on Saturday morning -- it didn't get sunny in the gulch until much later because of all the surrounding mountains -- we could see a lot more of what was going on in the aid station. Too bad we missed that during the night. Because most of the runners had already gone through Grouse we mentally started to wind down and the volunteers began consolidating their equipment and supplies. Jim continued to report the times in and out for a while after Paul woke up, until Paul couldn't stand just listening any more and resumed calling times to Silverton. Saturday morning at Grouse: another gorgeous day to be alive! Our absolute cut-off at Grouse was 10:30 AM. By 10 AM there were only a handful of runners who hadn't come in. That's when Paul suggested Jim and I go ahead and leave on our planned hike up to American Basin and Handies Peak. I'll write about that in the next entry so you can see what runners faced the next few miles beyond Grouse. The last runner came into Grouse at 10:20 AM. Even though she was a few minutes ahead of the cut-off, she dropped there. Paul and Jigger stayed at Grouse with the aid station captain for several more hours until the last-runner-standing reached the next aid station (Sherman) a long and difficult 13� miles later. They were still waiting when Jim and I returned from our hike. The last runner checked into Sherman at 3:55 PM on Saturday. It was HRH veteran Leonard Martin. He finished the race, but unfortunately he was two minutes over the official cut-off at the end. As noted on the race homepage after the race, he displayed "a graceful acceptance that reminded us all what a gentleman he is." 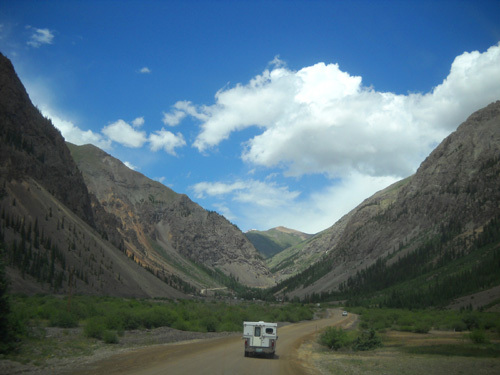 from the road at Grouse Gulch. The sky looked like this both Friday and Saturday mornings. Although it got plenty cold next to the river in Grouse Gulch during the night Friday/Saturday, the weather this year may have been the best in race history for everyone involved. We had none of the usual rain/sleet/hail at Grouse and I don't think there was much precipitation anywhere else in the mountains. There was less snow than normal at the higher elevations, the trails and cross-country sections were more dry, the streams were lower. Despite the great weather and course conditions, the front-runners were a little slower getting to Grouse Gulch than the clockwise course record times. However, according to Paul's records from Grouse two years ago (also in the clockwise direction), a higher percentage of runners came through our aid station with faster times this year than in 2008. I also noted at the awards ceremony that several veteran HRH runners had personal bests on the course this year. When Jim, Cody, and I got back down from our hike up toward American Basin around noon, the aid station tent was still up but most everything else had been packed up and hauled away. Paul and Jigger thanked us for our work and sent us on our merry way. One or both of them remained close to their radio another four hours until all the runners made it to Sherman. We mostly enjoyed working communications at Grouse but would enjoy it more in the CCW direction at 41.6 miles when more runners come through in daylight and we can at least see them (and vice versa). We both prefer having more direct contact with the runners, so a timing job right next to the entrance into or out of an aid station suits us better than sitting farther away and being more isolated from them -- day or night. Jim had a good experience working with Paul on the radios; he's a knowledgeable and personable guy. Jim does believe, however, that it would be more efficient to report the runners' times via packets from Grouse than calling them in on the ham radios the traditional way. He enjoyed reporting from our own vehicle, which was more comfortable and had a better view of what was going on. At dusk on Friday night, runners were still few and far between at Grouse. The bubble came after dark. These issues make us think more about what might be the "best-fitting" communications job for us at Leadville in August, as well as if or where we'd rather be assigned the next time we work the radios/timing at Hardrock. It is volunteering, after all, so we may as well have as much fun as the runners do! On the way back into town we drove a few blocks out of our way to return some large beverage containers from the aid station to the ski lodge, which served as the staging area for the aid station equipment and supplies this year. The runners come down a trail here and finish up at the gym less than a mile away. It was fun to see a couple of the early finishers bomb down that hill and make their way to the finish line, which is where we drove next. The finish area early Saturday afternoon; runners would be coming in until 6 AM on Sunday. We spotted our friend Marcy Beard right away at the finish -- she expected her husband John to come in soon. After being awake all (me) or most (Jim) of the night, we were more than a little tired and sleepy, so we left within a few minutes. I wish we'd stayed about fifteen minutes longer, however, so we could have seen John kiss the "hardrock" under the finish banner a minute before 1 PM. He had a great run this year (30:59 hours), finishing ninth overall and missing eighth place by only two minutes. Good job, John!! All Hardrock Hundred finishers must kiss the hardrock at the end of the race -- it's an honor! When we got back to the camper we got cleaned up, ate lunch, and took a nap. Oh, it felt good to sleep a couple of hours . . .
After we got up we had fun watching the "live" results on the internet during the afternoon and evening on Saturday. Results were posted pretty quickly. 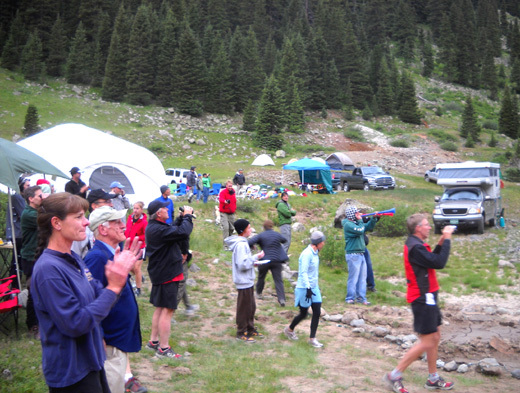 We cheered when friends reached another aid station or came across the finish line. We were disappointed when we saw that a couple of our friends dropped out or missed cut-offs after Grouse Gulch, and patiently waited until the awards ceremony the next morning to find out what went wrong. When we went to bed at 9 PM there were about thirty runners still out on the course. They still had nine hours to finish. Jim and I were so exhausted we slept till 7 AM on Sunday, missing the final excitement at the finish line. We aren't 35 any more, after all. We did make it to the awards brunch at 9, however.